PHAM BINH MINH, Minister of Foreign Affairs of Viet Nam, said that while peace, cooperation and development were the overriding features of our time, tensions and conflicts persisted in most continents and regions. The world economy’s unstable recovery, coupled with economic downturns in many developed nations, had exposed developing ones to risks of even further unequal terms of trade, rising protectionism, dwindling financial resources and erosion of gains made towards achieving the Millennium Development Goals. Additionally, multilateral negotiations on issues such as disarmament and climate change had not yielded results “up to our expectation”, he said. The key to peace, security and stability lay in each nation’s own efforts, but also in enhanced international cooperation and multilateralism, he said. Over the past years, the United Nations had played an increasingly crucial role in ending conflicts and promoting the peace process in various regions. Viet Nam deeply valued the initiatives putting the needs of the poorest and most vulnerable at the centre of the international agenda and mobilizing resources and capacities. The Organization should continue its concerted and coherent efforts to promote peaceful settlement of civil wars and local conflicts in several regions, especially North Africa and the Middle East, while preventing others from erupting. Viet Nam also supported efforts to end violence and strengthen national reconstruction and reconciliation in Afghanistan and Iraq. He also noted that Viet Nam recognized the State of Palestine in 1988 and had always supported the right of the Palestinian people to establish an independent and sovereign State. In parallel with security concerns, the United Nations should work for more equal international relations and fairer international economic and financial architecture and institutions, he said. Developing countries must have a greater role and say in international governance. Among other key actions, developed countries should successfully complete the Doha Round, eliminate unfair trade measures and increase development assistance, he said. 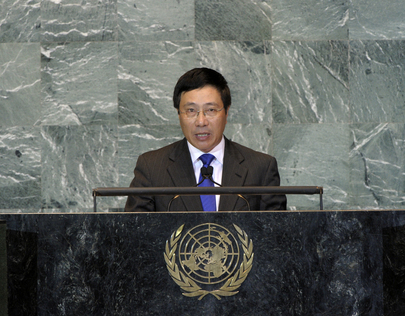 Viet Nam recommended that the United Nations convene a follow-up meeting to the outcome of the Conference on the World Financial and Economic Crisis, which was held in June 2009, and strongly called for an end to the economic embargo against Cuba. Moreover, he said, to promote inclusive and sustainable development, political commitment and efforts – with the central coordinating role played by the United Nations – must be doubled. Viet Nam was working with other Member States to revitalize the General Assembly as the principal deliberative, policy-making and representative organ of the United Nations, and to enlarge the Security Council and improve its working methods. The operation of the Human Rights Council and other human rights mechanisms should continue to be improved to become more effective, efficient and consistent. To make more of a contribution to that end, Viet Nam had presented its candidature for membership in the Council for the term starting 2013. During the last 25 years of comprehensive renewal, Viet Nam had made significant achievements. Now Viet Nam was determined to step up the renewal process in a comprehensive manner with higher quality and effectiveness. It would also continue to implement its independent foreign policy for peace, cooperation and development, meanwhile aiming to be a “reliable friend and partner, as well as responsible member of the international community”. It was working with regional groups in various capacities, including through its strong commitment to dialogue, conflict resolution and peacebuilding mechanisms — including the 1982 Convention on the Law of the Sea. Pending a solution agreed on by all relevant parties, Viet Nam would continue to strictly observe the Declaration on the Conduct of Parties in the Eastern Sea, and looked forward to the conclusion of a Code of Conduct in the foreseeable future.